The Annual Palliative Care Research Network Symposium offers researchers opportunities to learn from global experts, share and exchange knowledge and network with peers. Information about the 2018 Symposium can be found below, programmes for past event can be found at the bottom of the page. In this century over 40 million people worldwide are likely to need palliative or end-of-life care for their life-limiting or chronic illness. This international public health issue will require greater integration of palliative care services within the healthcare system. The World Health Assembly, which is the governing forum for the World Health Organisation, has urged its 194 member states to develop, strengthen and implement palliative care policies to support health systems to integrate evidence-based, cost-effective and equitable palliative care services. The Palliative Care Research Network (PCRN) 7th Annual Symposium is an island of Ireland event that promotes the impact of palliative care research to improve palliative care by changing practice and policy. It provides access for early, mid-career and senior researchers to leading international and national research and opportunities to network and collaborate. This year’s symposium, jointly funded by the Health Research Board (HRB) and Health and Social Care R&D (HSC R&D) focussed on latest evidence-based research on integrated palliative care in Europe and how to support carers. The day provided valuable insights and perspectives from international speakers and panel discussions with 76 people attending from the island of Ireland including people with life limiting conditions, family carers, researchers, health care professionals, legal and advocacy professionals, service providers, policy makers, charity organisations, funders and interested citizens. 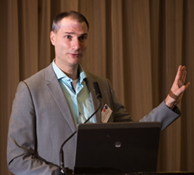 Dr Jeroen Hasselaar (keynote speaker), Assistant Professor in Anesthesiology, Pain and Palliative Medicine, University of Radboud University Medical Centre in the Netherlands, shared the latest research on how palliative care has been integrated into health care systems in Europe. Jereon was responsible for co-ordinating a European funded research project on Integrated care for people with advanced cancer, chronic obstructive pulmonary disease (COPD) or chronic heart failure in Belgium, Germany, Hungary, the Netherlands and United Kingdom. He spoke about the main challenges to connect services and initiatives in palliative care together, to meet the needs of the person with palliative care needs. Jeroen said that what is required is the “right care, at the right time, in the right place with the right care giver”. One of the main findings of the research was that palliative care providers stay directed to the needs of the person with life-limiting condition and their family carer. This requires collaborative and creative leadership to avoid over administration and bureaucracy particularly when care is delivered across services. During a panel discussion on integrated care on the island of Ireland, John Joyce from Voices4Care who is receiving palliative care, Dr Felicity Hasson Senior Lecturer in Nursing, Ulster University, and Dr Joan Cunningham Medical Director at Our Lady’s Hospice and Care Services spoke about their varied experiences of receiving and providing integrated palliative care. Professor Gunn Grande (keynote speaker), Professor of Palliative Care at the University of Manchester, where she leads the Supportive and Palliative Care group at the Division of Nursing. Midwifery & Social Work presented research on carers, impact of caregiving and predictors of negative impacts of caregiving. She spoke about interventions that can reduce the impact of caregiving. Gunn referenced how most of the carers may be family members or friends and may not define themselves as carers. She presented how according to a Health Survey for England (2013) 7.6% of the population reported that they provided hands on care to someone close dying of terminal illness in the last 5 years with 47.5% providing daily care. She spoke about how it becomes difficult to enable care at home if the carer is finding it difficult to cope with a crisis situation. It is key that policymakers and palliative care providers invest in interventions that can support carers to maintain their psychological health and functioning so they can sustain care at home and prevent acute inpatient admissions. 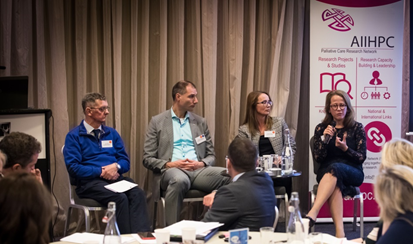 During a panel discussion on how can research support carers, Harry Cheevers from Voices4 Care who provided care for his wife Lena in the last year of her life, described how words are important for example that people may not describe themselves as an “informal” carer. Craig Harrison, Policy and Public Affairs Officer for Marie Curie Northern Ireland spoke about the importance of carer assessments, the need to remove the jargon around research and train researchers on how to impact policy. Dr Geraldine Foley, Assistant Professor of Occupational Therapy, School of Medicine, Trinity College Dublin and a PCRN member spoke about the ethics in Palliative Care research and efforts required to ensure that research is focused on the real issues. 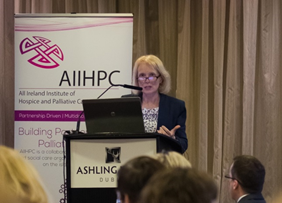 Dr Kathleen Mac Lellan, Assistant Secretary, Social Care Division, Department of Health (Republic of Ireland) who jointly opened the symposium spoke about the importance of clinical guidelines in palliative care and how AIIHPC has supported implementation in practice through education. She also spoke about the need to ensure that the person gets the care they want, the need to educate health professionals around access to services and building awareness of palliative care in the younger generation. Jackie McIlroy, Deputy Chief Social Worker, Department of Health (Northern Ireland) who jointly opened the symposium spoke about the important role of social care in providing palliative care for people with life limiting conditions. She spoke of her own experiences of providing care for her husband at end-of-life and how this has informed her work in relation to best practice in providing care. 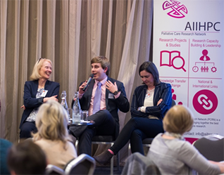 Dr Darrin Morrissey, CEO of the Health Research Board spoke about how the HRB is supporting palliative care research through AIIHPC’s Palliative Care Research Network. He mentioned how the PCRN aligns with the HRB Strategy 2016-2020 and acknowledged the current challenge for health being the implementation of the Slaintecare programme within the context of Brexit. Dr Janice Bailey, Assistant Director Health and Social Care R&D, PHA Northern Ireland reiterated Darrin’s comments in relation to the move from acute to community care in the shift to a patient-centred approach. She talked about how the HSC R&D Strategy 2016-2025 focuses on how to support research in line with strategic priorities keeping patients and service users at the centre. Karen Charnley, Director of AIIHPC provided an update on the work of the Institute with Fintan Fagan, AIIHPC Chair and CEO of St Francis Hospice speaking about the importance of AIIHPC’s partners in supporting this work. Dr Bernadette Rock, Policy and Research Manager, Alzheimer’s Society of Ireland and Kay Duggan-Walls, EU Programmes Office, HRB provided valuable insights. We would like to acknowledge Professor Joanne Reid, Chair of AIIHPC’s PCRN, School of Nursing, Queen’s University Belfast for chairing the symposium; and Dr Suzanne Guerin, Vice-Chair of the AIIHPC’s PCRN; Deputy Director of the UCD Centre for Disability Studies and Associate Professor, School of Psychology, University College Dublin (UCD) for her role as chair of the panel discussion. If you have any queries or comments about the symposium please contact Dr Mary Rabbitte, Research Programme Manager AIIHPC at mrabbitte@aiihpc.org.